Ever think that you can't get that great morning boost without having coffee? Wrong! 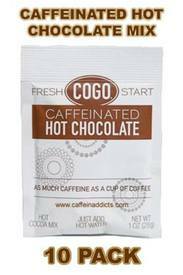 COGO caffeinated hot cocoa mix provides the boost you need first thing in the morning or whenever you need a pick-me-up! The delicious way to indulge your chocolate craving while getting a boost! A delicious alternative to coffee!